FRAMINGHAM – The Framingham State men’s soccer team scored to first half goals on their way to a 2-0 victory over UMass Dartmouth to open up the 2018 season Friday afternoon at Maple Street Field in Framingham. Framingham High graduate Bryce Nardizzi scored the game winner. he scored at the 31st minute on a pass from Vinicius Vega. 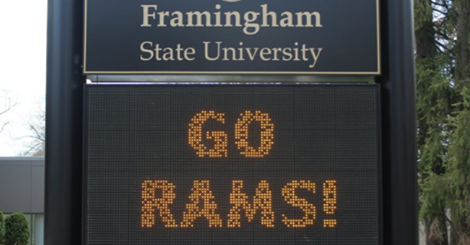 The Rams added to their lead less than four minutes later when Veiga collected a pass from Isaac De Souza, who hails from Sao Paulo, Brazil, dribbled around a defender and sent a low strike past the UMass Dartmouth keeper. The Corsairs had an excellent chance to take an early lead when UMass dartmouth was awarded a penalty shot but the attempt went just wide of the post. The Corsairs also had a chance to cut into the lead late in the second half when Joe Morehead’s shot hit the cross bar and deflected out of harms way. Corey Davidge made five saves in the shutout win for the Rams. Danny Andrade made two saves and allowed two goals in the first half before giving way to Jacob Castro, who turned away one attempt for UMass Dartmouth. The Corsairs collected 26 fouls and four yellow cards to the Rams 23 fouls and two yellow cards in the physical match. The Rams travel to Suffolk for a non-conference tilt on Labor Day, September 3 at noon.